Prior to Lessing and several of his contemporaries, painting and poetry were considered to be relatively similar in how they were produced, from the point of view of their aesthetic conception. W.J.T. Mitchell commented that Lessing showed how “literature is an art of time, painting an art of space.” In Laocoon, the critic argued against Horace’s ut pictura poesis (lat. as painting, so poetry) as an aesthetic rule. In other words, he disagreed with trying to create poetry using the same means as one would in painting. Instead, poetry and painting each has its character; the former, as Mitchell noted, is extended in time; the latter develops in space. Lessing emphasized the independence of the written or verbal aspect from the pictorial or visual aspect. The story of Laocoön was used as a metaphor to his theories. A Trojan priest of Apollo, the mythical figure was destroyed (along with his two sons) by two giant serpents sent by the god Poseidon (Apollo). Lessing’s writing revolves around the differences between the representation of Laocoön’s death in the poet Virgil’s Aeneid and the undated (Early First Century B.C.E.) 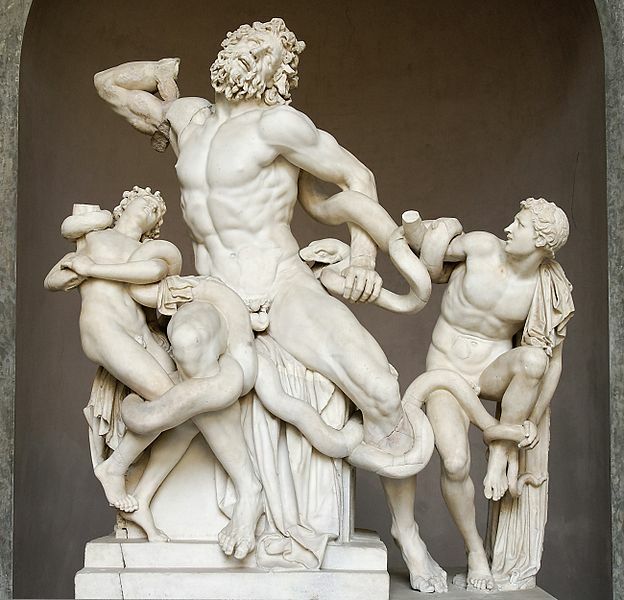 sculpture of Laocoön, attributed to the Rhodian sculptors Agesander, Athenodoros, and Polydorus (now in the Vatican Museums, Rome). Here is Virgil’s poem and beside, the marble sculpture capturing the same episode in ancient Greek mythology. The central question with Lessing is whether the sculptor relied upon the written record provided by Virgil, or the latter turned to the sculpture for inspiration. So, the visual arts can depict certain qualities which poetry cannot and viceversa. However, Lessing seems to elevate poetic production above painting, for example, because he believes the scope of its production is greater, as well as its imaginative capacity to the senses. Also, while painting, or any traditional form of fine art, could only depict the singular moment, poetry could capture the object in succession. “Thus, a girl laughing can only be depicted in one moment of its duration in painting (for example, this could be the initial smile, the height of the moment with an open mouth and closed eyes, or the closing of the laugh where the cheeks are flush and the smile is subsiding). Alternatively, the same moment could be depicted in its complete duration in poetry, emphasizing the physical, emotional, and intellectual content from beginning to end in whatever fashion seems most appealing.” Equally, while poetry is capable of expressing something ugly in a beautiful way without offending the senses, painting cannot do that without being distasteful visually. In Lessing’s Laocoon: Semiotics and Aesthetics in the Age of Reason (1984), David E. Wellbery writes that “Lessing brings Enlightment culture to a closure by rounding off the analysis of the aesthetic process of signification. He contemplates the relations between plastic arts and poetry in their material differences (of signs, syntax and content) and in the structure of signification they share. The ultimate unity between these arts is based on the idea that all arts share the status of natural signs and that all arts bring about an intuitive presence which defines the nature of the aesthetic experience.” (Porter Institute for Poetics and Semiotics, Duke University Press, Poetics Today, Vol. 6, No. 4, 1985). So, the beauty lies in the unifying interrelation of the various arts disciplines with each having a well-determined niche function in themselves.